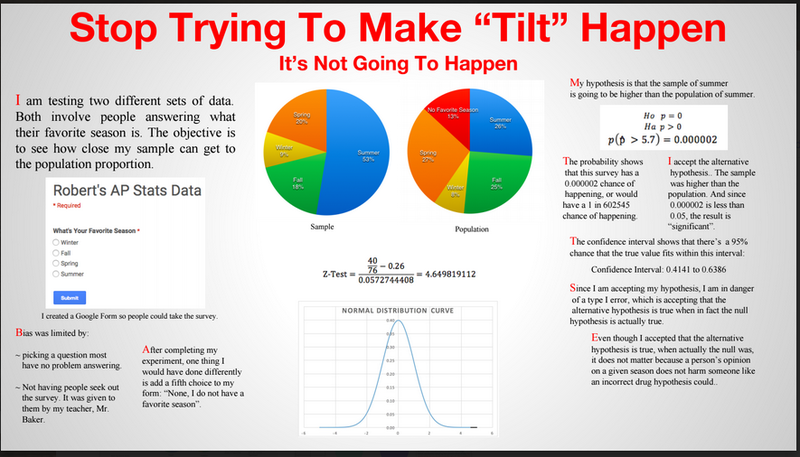 As I wrote a couple weeks ago, I enlisted the help of a doctoral student from Washington University to give some tips/insight on making and presenting their posters, and we spent the last 5 days of class working on our survey instruments, analyzing the results, and presenting them on a poster. This is the first time these projects/experiments have ever had an audience beyond myself, so I'm really excited to see my students out in the "real world" talking about statistical inference. 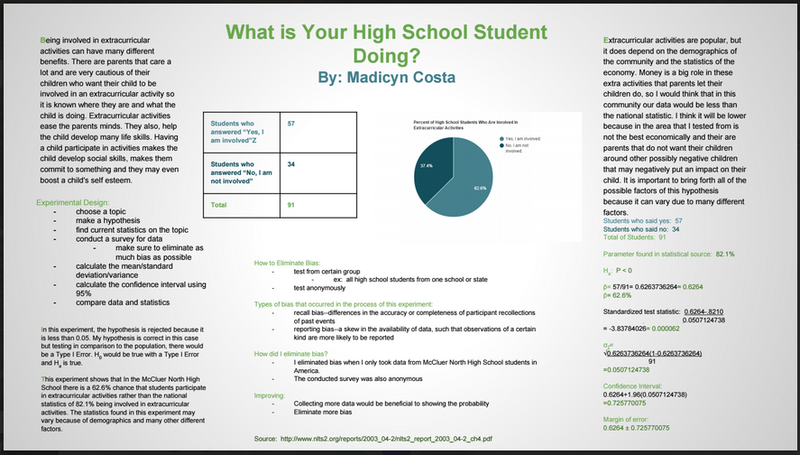 I literally had a student email me over the weekend and tell me she would change whatever I asked and do whatever I demanded so her poster could be perfect. You've gotta love that. The NYU research poster guide and continued support from +Ryan Watkins ended up being a huge help, and after an assist from the CAD teacher downstairs, I'm real excited with how these posters turned out. I had one student who could not make the Expo, so I had him present last week to our friends at another high school in our district in AP Chem. There's always something special about seeing kids describe and defend their work that is better than most of the feedback that a teacher could ever give traditionally. They often find errors in their writing, their process, and bits that are confusing or could be more clearly explained as they try to sort out what their work SAYS with what it is actually supposed to be communicating. We found a few errors in the graphical representations or calculations as we were sharing with parents at the Expo, but I was so thrilled that they found them and corrected the mistakes that I couldn't be anything but proud of them. If you'll notice the poster in the video, he has a lot less going on... he actually only did about half of the work, and I don't know if he noticed it until he got to the end of describing his methods after a couple minutes and didn't really have much to SAY about it - nothing to interpret. There's a verbal pause where (I hope) he realizes he's done, but shouldn't be.